So I am trying a new restaurant and a new food for lunch. Zocolo has a wonderful atmosphere! I ordered fried pickles and crayfish and corn chowder. 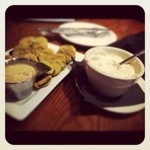 Fried pickles are a bit of a weakness for me and I like to try them where ever possible. These did not disappoint! They are think sliced and seasoned well. The dipping sauce is different from the ranch variations that I’m used to, but it has totally won me over. Now I have never had chowder before. I have slight trepidation over the thickness and not being able to see the ingredients. However the taste is amazing! This place really knows how to use seasonings! Something I have found to be a rarity among too many restaurants as of late. So I’d have to say that this place has definitely enticed me back for another visit. Maybe I’ll check out their dinner menu.